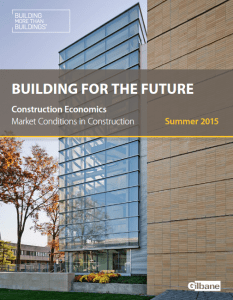 Providence, RI – September 18, 2015 – Leading global construction and facilities-related services firm Gilbane Building Company recently announced the findings from its in-house quarterly economics report: Building for the Future – Construction Economics: Market Conditions in Construction. Among its most notable findings, the report indicates spending on nonresidential buildings is on pace to grow by 20 percent-plus by end of 2015. Further, non-building infrastructure spending, after a brief gain, will go flat or decline until moderate growth resumes in the fourth quarter of 2015. According to the report, total spending for all types of construction will grow 11 percent year- over-year from 2014 to 2015. The year started at an annual rate of spending near $995 billion and is expected to finish at a rate of $1.100 trillion. The total construction workforce hit a 15-year low in 2013 at about 6.4 million. Currently the workforce is growing and is 7.0 million, still at a 15-year low, about 1.4 million lower than the 2006-2007 peak. Spending in 2015 is increasing at a much faster rate than hiring. That is contrary to what is expected in a typical growth period, during which it would be normal for labor to grow faster than spending. Although there is widespread discussion of labor shortages, the difference in new construction volume versus labor growth may be due to hiring and hours worked growth exceeding new construction volume in four of the last five years. Even with volume growing faster than labor this year, which means improved productivity this year, we still see a net productivity loss during the last 6 years of new construction growth. This is typical of expansion periods. Construction spending is increasing at the fastest rate of growth since 2004-2005. Total construction spending across all sectors will grow by nearly 11 percent in 2015, reaching $1.067 trillion — the second-highest recorded growth total ever. In the first quarter of 2015, the seasonally adjusted annual rate for all spending averaged $997 billion. In the last quarter of 2015, spending will average greater than $1.100 trillion. 2015 spending advances will be supported by the strongest gains in nonresidential buildings spending in eight years. Construction starts for new nonresidential buildings for the last five quarters were the five highest since Q3 2008. Residential construction spending will grow in 2015 by 12.9 percent to $388 billion, but will then slowdown in 2016 — rising only 12.0 percent. Inflation Adjusted Construction Volume (constant 2015$) 17 percent below 2006 peak. The complete report, Building for the Future – Construction Economics: Market Conditions in Construction, and its executive summary are available free for download here at https://www.gilbaneco.com/economic-report. Gilbane provides a full slate of construction and facilities-related services – from pre-construction planning and integrated consulting capabilities to comprehensive construction management, close-out and facility management services – for clients across various markets. Founded in 1873 in Rhode Island and still a privately held, family-owned company, Gilbane has more than 50 office locations around the world. Gilbane was named to Providence Business News’ Best Places to Work list in 2015 and is an eleven time member of Training Magazine’s Top 125 companies.